Want your own Dalek desk dolls? 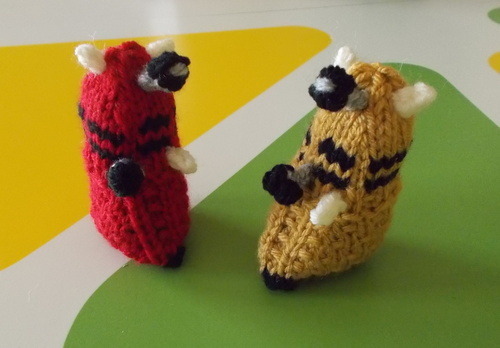 Mini Daleks are now available in my shop! They come in a set of 3. You may request custom colors if you’d like. I’m working on making a smaller version of my large Adam-12 Police Car. I still need to play around with it a bit, but it’s pretty darn cute. Remember that tomorrow is Free Pattern Friday – so be sure to check back here tomorrow to get your free pattern. There just might be a few more bonus items to thank you for reading, too! 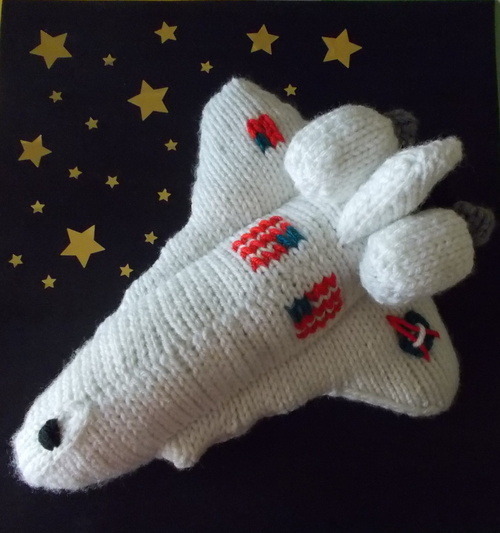 Mini Space Shuttle toys are now available at DrFrankKnits! They’re available with or without a keychain attachment and can easily be converted into a Christmas or other ornament if the desire arises! They measure about 3 inches tall and 3 inches long … and they also come with a free Saturn ornament to complete the look! If you like these mini shuttles, you’ll also love my interactive large shuttle model! It has retractable landing gear! 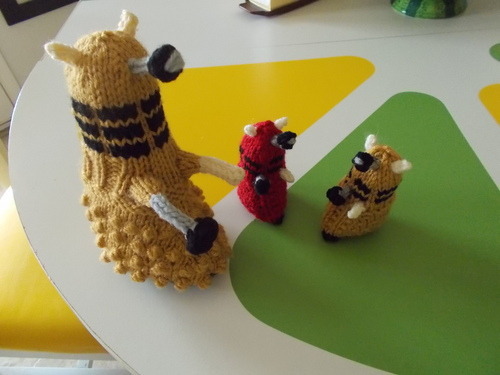 As with all my toys, these are my original designs and are fully hand-knitted by me! If you’re like me, and have been in love with outer space and space science for as long as you can remember, these are definitely items you don’t want to miss out on! Check out the above links and http://www.etsy.com/shop/drfrankknits for more info! 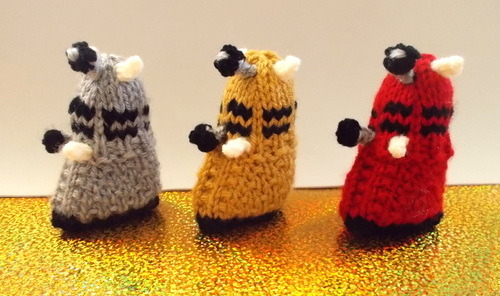 Please welcome the newest members of the DrFrankKnits small model family: The Daleks! Watch out, though. They just might EXTERMINATE you with cuteness! I think I will work on making these available for sale in the near future. They stand on their own, so they’d make a great desk ornament – but I’ll probably offer them with an option of a keychain as well. They’re a little over 3 inches tall. I made a larger Dalek model some time ago, but the endless bobbles on the lower section drove me nuts … so this smaller model with a seed-stitch type lower section is much more doable. In truth, I’ve only seen a handful of the older Doctor Who episodes, so I’m not the greatest authority on the subject. I’ve always thought that I should be a rabid fan of the show, but never seemed to get caught up in it. However, I know the show continues to be very popular so I’m going to try to make a point to catch some of the newer stuff soon! I hope the tiny Daleks made your day – keep an eye out here for more news and information on these and other cute softies! What’s Going On This Week! 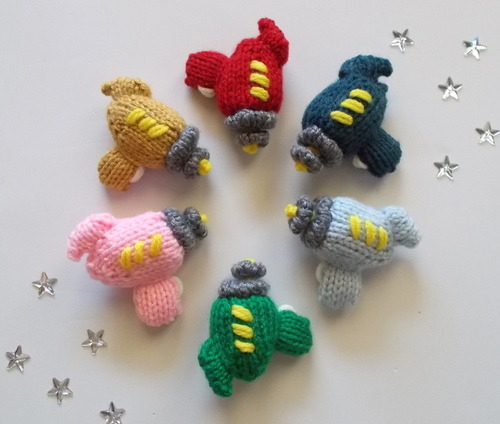 The tiny retro ray guns are finally available in my shop. You can get them with or without a keychain attachment. The colors shown are ready-to-ship, but feel free to request any color! Also, if you want more than one, there’s a listing for buying 3 at a time for a special price! These are definitely one of my favorite items! Also going on this week: I’m working on writing up a new pattern for the shop. Can you guess what this is going to be? It should be ready to go before the end of the week, so you won’t have to wait too long to find out! Another feature I’m introducing this week is “Free Pattern Fridays.” Ideally, I’d like to have a new quick-to-knit free pattern available every Friday … though that might be a little ambitious. However, even so, I hope to at least have 2 per month! To that end, if you ever have any ideas for things you’d like to see on Free Pattern Fridays please let me know! This Friday’s item is super-adorable, so make sure to follow me so you don’t miss out! It’s Independence Day, which also means it’s pie day around these parts! Of course, don’t confuse this Pie Day with that other Pi Day. Well, actually, if I had my druthers (and a faster metabolism) everyday would be Pie Day! It’s my favorite dessert. Particularly apple pie, but, really, I never met a pie flavor I didn’t like. How many people can say they’ve traveled 5 hours, one way, just to go to a place called Pie Town? Not many, I would guess. Sure, I make a pie just as good at home, but it’s the principle of the thing! I remember my mother asking why I didn’t just go to Rock Springs Pie Café 30 minutes away in Black Canyon City. I just shook my head, and thought to myself, “If she has to ask that question, she’ll never understand the answer.” Anyway, I never understood the buzz surrounding that place. I don’t care for their pies at all. 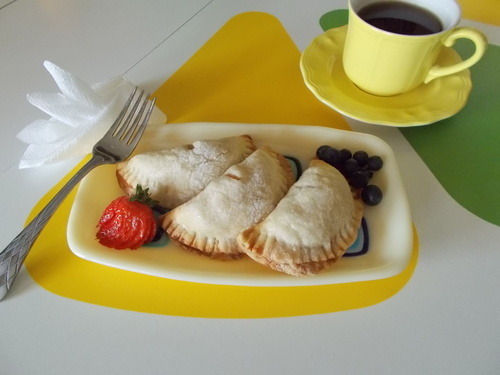 Lately, I’ve taken to making empanadas, or hand pies … whatever you choose to call them. A) because I’m never serving a large crowd these days and B) because they’re easy to store and freeze exceptionally well for those unexpected cravings. Sure, I can’t dump a truckload of streusel on top of them … hmm, actually, I think I still could. Note to self: try that next time 😀 . 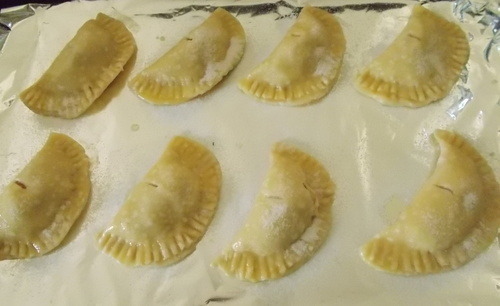 Anyway, that’s what I’m up to today: baking apple empanadas. I wish the lighting for my pictures was better, but Phoenix, AZ picked this one day to be overcast 😀 If I actually used a recipe for these, I’d be happy to give it to you, but I’m notorious for “winging it.” I chop some apples, add some sugar, cinnamon, a pinch of salt and some lemon juice, then simmer it all until the apples are tender. After that, I thicken it with a little cornstarch slurry, then let it cool. My pie crust is the classic Crisco crust – and before you get all hoity-toity and demand to know why not butter, I have to say that butter crusts just don’t do it for me. They’re never flaky enough. And heck, have you seen the price of butter these day? Ridiculous. Roll, fill, egg wash, sugar and bake. Easy as … well, pie! Going along with the discussion of pie, I made pie softies some time ago for my shop – and it’s probably about time I released a pattern for them, too! 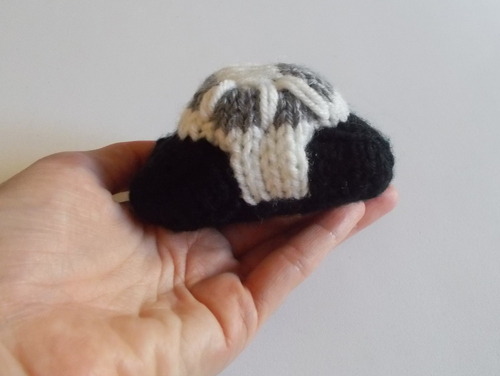 I’ll definitely keep you apprised of that here in the coming weeks, and check out the finished product at https://www.etsy.com/listing/184210513/small-knitted-pie-softies-individual?ref=shop_home_feat_4 ! 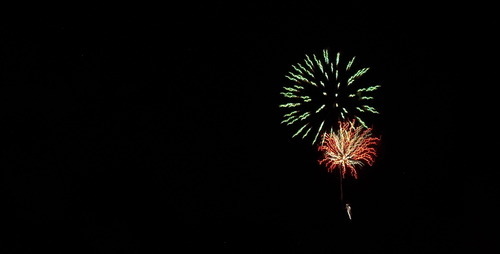 Food, parties, memories, friends, family and good times are definitely All-American things … things that our unique freedoms allow us to enjoy. So, I hope everyone has a wonderful, relaxing day enjoying all of those things! Hi! 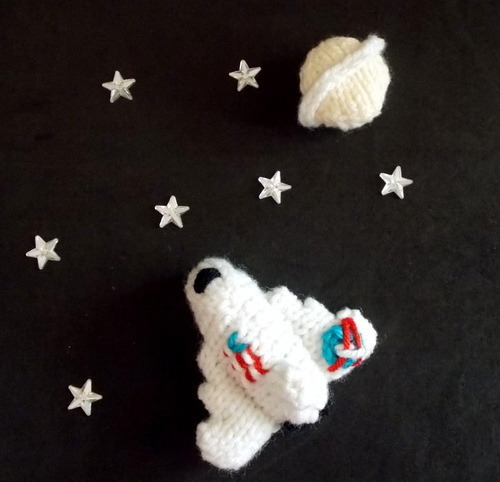 My name is Ilana and I run the Etsy shop DrFrankKnits, a handmade knitted toy and pattern shop! I design crazy, silly, funny, and strange soft toys! I’m learning that to make a splash in this modern, technological world, I need to up the social interaction factor – so I’m trying out this “newfangled” blogging thing. I set up a Tumblr blog, but clearly I’m too much of a dinosaur to get any interest there – and I wind up talking to myself. Of course, I talk to myself a lot anyway, but it would be a shame for all my interesting chatter to fly under the radar. So, I’m trying out this WordPress thing as well. My game plan is to highlight the original designs I’m working on, to detail my creative process, and to offer fun, free patterns and other stuff to thank the people who take the time to read my ramblings 🙂 . 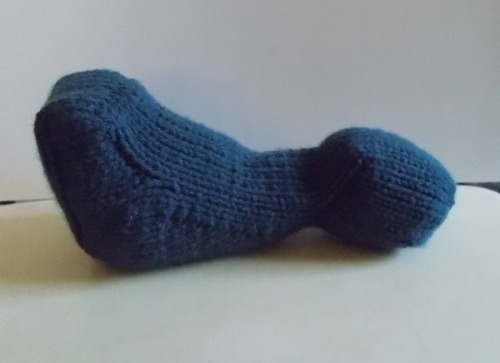 Although I’m a knitter, I endeavor to make this more than just a knitter’s blog. I hope to appeal to many people – because I love to talk about almost anything. If you like to laugh, learn and discover, I’ve got you covered!